Instability in the thoracic spine is as lumbar instability. If this instability in thoracic spines is present, it manifests as a spondylolisthesis or the forward translation of the cephalad vertebra on the caudal one. The costovertebrals joints and rib cage are very important when it comes to stabilizing the thoracic spine. The rib cage is fixed to the thoracic spine by the costovertebral joints, which consists of costotransverse joints and joints of the head of the ribs. Thoracic vertebrae are connected to adjacent vertebrae by the bilateral costovertebral joints. 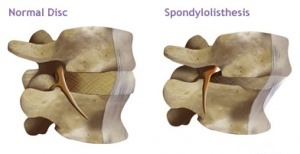 There are many causes that induce thoracic spondylolisthesis. The first cause is the dysfunction of the intervertebral disc which can lead to instability because of a lack of disc height. Furthermore this leads to a relative laxity in the motion segment. ‘Horizontalization’ of the lamina is the second cause that can lead to instability. The second test for lateral translation stability (rotation)  (Level of evidence 2C) is to evaluate the stability of a midthoracic segment. It is necessary to first determine the available mobility in lateral translation. The most instability can be found in the region between T3- T7. This motion is tested in the following manner: the patient is sitting with his arms crossed on his chest. The therapists’ left hand fixes the transverse process of T6. With the other hand you translate the T5 vertebra and the sixth ribs to the right in the transverse plane. The quantity and the end feel of motions are reported and compared to the levels above and below. The stability of the T5-6 spinal component can be assessed by constraining the sixth ribs from gliding relative to their transverse processes and then applying a lateral translation force. No motion should occur when the ribs are fixed. The contraction of the related muscle activity according to the spine segment with the usage of Stabilizer Pressure Biofeedback unit (Chattanooga,USA). The training programs aimed at creating neutral spine and activation of deep muscles of the spine. The participants were asked to maintain the positions and contractions during the exercises and throughout the day as much as possible.